So, after Abram had lived ten years in the land of Canaan, Sarai, Abram’s wife, took Hagar the Egyptian, her slave-girl, and gave her to her husband Abram as a wife. He went in to Hagar, and she conceived; and when she saw that she had conceived, she looked with contempt on her mistress. Then Sarai said to Abram, “May the wrong done to me be on you! I gave my slave-girl to your embrace, and when she saw that she had conceived, she looked on me with contempt. May the Lord judge between you and me!” But Abram said to Sarai, “Your slave-girl is in your power; do to her as you please.” Then Sarai dealt harshly with her, and she ran away from her. Despite God’s commitment to give Abram and Sarai a son, and to bring about generations of descendants from their single little household, the long delay in the fulfillment of that promise tempted the aging couple to take things into their own hands. They fell to that temptation (take care not to judge them too harshly), and found a way to make things happen themselves. Hagar, and later her son Ishmael, seem to represent a diversion from God’s plan, a departure from the covenant he was making with Abram and Sarai and their descendants. Nevertheless, God works with what he is given by his flawed children. Hagar and her unborn child could have been left alone in the wilderness, silently disappearing from history. Instead, God intervenes, sends his angel, and a new nation is born. Bereft of companionship and cast forth from the only family she knew, Hagar was comforted and instructed by the angel of the Lord, who later was sent also to save Ishmael’s life (see Genesis 21). This is actually the first time that the word angel appears in the Bible. The word angel means “messenger,” and the message of this angel came in three ways, all having to do with the essential role of angels. First, the angel asked a question of Hagar – “Where have you come from and where are you going?” – as if the angel didn’t already know the answer. (Remember, this was the same method used by the fallen angel too, when he first came to Eve: “Did God say…?”) It appears that this question was designed to begin a conversation with Hagar who, at that point, probably did not realize that the person she was talking with was a messenger from Heaven. Apparently, angels are able to converse with those to whom they are sent. They are bringing a message, but they can listen as well. Second, the angel makes a command: return. Telling Hagar to go back to her mistress and to submit to her, unfair as these instructions may be, seems to be the main point of his intervention. Hagar was headed in the wrong direction. 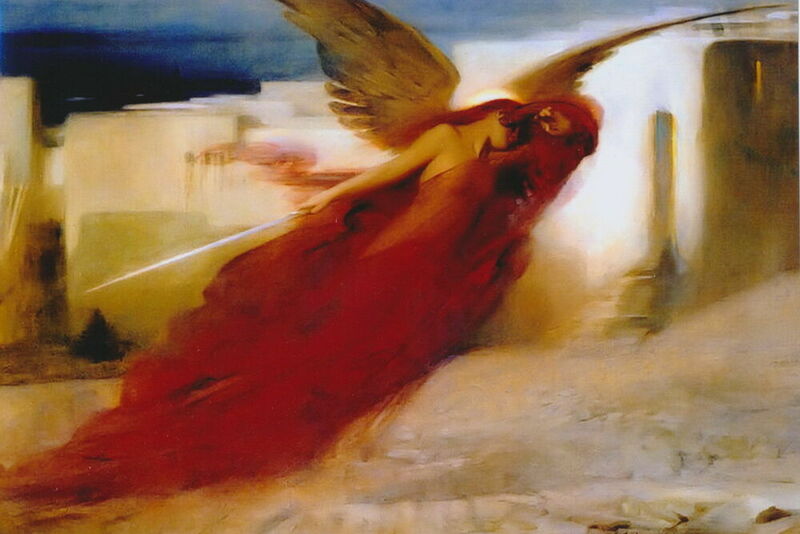 The angel was sent to set her back on course. Third, on behalf of the One who sent him, the angel makes a commitment to Hagar: “I will greatly multiply your descendants.” Hagar will return home, now with a divine promise in her heart to keep company with the child in her womb. Conversation, command, commitment – as messengers of God, angels have the ability to bring a wide array of methods to their task, and we will encounter these methods as we read of other angelic appearances. In this case, they all worked together to prevent Hagar from taking a very wrong turn in her life’s direction. We are never too far from home to be found by the angel of the Lord.